If you are organising or facilitating these exercieses, make sure that you understand any sensitivities within the group regarding political and social trends and manage the discussions accordingly. If you are in a conflict environment, or working with people affected by conflict, carrying out a conflict analysis first should be seriously considered. PESTLE analysis is the analysis of trends and factors that can affect the context in which humanitarian action is carried out and/or your organisation as a whole. It requires the user to look at six different domains: political, economic, social, technological, legal and environmental. When carrying out a PESTLE analysis, pay particular attention to the political, economic and social factors that can result in power dynamics that have a negative impact on the affected population and particularly vulnerable groups. While there are a number of versions of this tool that have fewer domains (PEST, STEEP), we would recommend using PESTLE so as to ensure inclusion of legal and environmental factors. The legal situation can be critical for innovation, whether it is around organisational registration, or the ability to protect intellectual property such as patents. Also include here any humanitarian principles that might be affected by the trends you uncover. Consider the potential impacts of climate change or other natural hazards in the environment section. The result of a PESTLE analysis is a document that enables you to identify trends and understand opportunities and threats at a macro level. 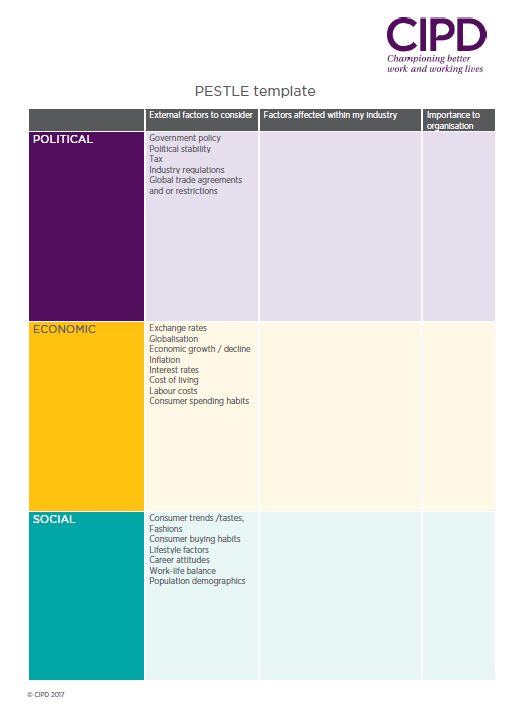 In this way it can be used as a precursor to a SWOT analysis (the outcomes can be used to populate the ‘opportunity’ and ‘threats’ segments of the SWOT analysis) and for scenario planning (see following exercise). Scenario planning is not about predicting the future, it is about understanding possible and plausible futures and what their implications might be for a given context or sector and organisations working within it. Scenario planning can be used to look into the long term (50 years), or very short term (1–2 years). It is an activity that is designed to help you think about different potential scenarios that you may need to plan for. It can highlight both future problems and future opportunities. The key is not to think any scenario will be ‘fact’ – the future is notoriously difficult to anticipate. Instead, scenarios are there to point at potential, and to expand your thinking. 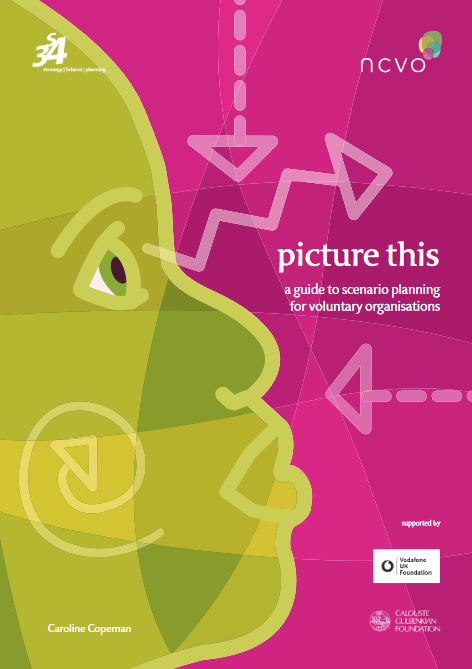 Download the NCVO Guide to Scenario Planning and use the templates and tools provided (pp 19-25) to plan and run a scenario planning workshop, engaging your colleagues and using the learning for inspiration.